We make this regularly since everyone that's ever tried it has loved it. It has all the flavors we're accustomed to thanks to the wonderful spice mixture. 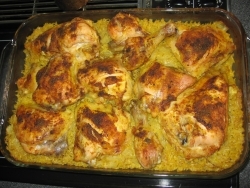 The rice is particularly good infused with the spices and the chicken flavors. I haven't changed this recipe much from the original as I learned it. Over the years I have added more chicken and less water (I'm down to 3 cups) and I usually double the recipe because it's great for leftovers as well. You can also serve it garnished with cilantro, but I usually forget and it still tastes great! Mix the onions and rice in one layer in a shallow baking dish. Add half of the spice mixture to the cold water and add the salt. Pour mixture slowly over the rice and onions. Add the chicken pieces to the baking dish and rub the remaining spices onto the chicken. (If you want to more evenly coat the chicken with spices, switch steps 3 and 4). Bake uncovered for at 375 degrees (F) for 90 minutes (varies depending on your oven, mine takes a bit long). Since the the brown rices cooks more slowly than white rice, it should be ready at the same time as the chicken, and all the water should be absorbed. We enjoyed this dish. We loved all the spices. It was better the first day though then for leftovers. i wanna try this recipe!